My Boots n Me: Stanley Park, Vancouver, B.C. I love the rain. Well, I live in B.C so I really don't have any choice but to embrace it. Sure beats whining about it. People come from all over the world to see Vancouver, and rain never seems to stop them from getting out and enjoying the views. Who knows, this could be their one and only trip here, and why miss anything because of a wee bit of wet. I personally have never seen a tourist melt in the rain, never. It's so much fun to see all the colourful umbrellas and raincoats people use to stay dry. I think that adds to whole charm of the city. Grey is .. well grey. But a bright red cheerful umbrella just says something. It celebrates life as it is .. it accepts life on its own terms. You can't change it so you may as well be cheerful and find something good about it. Stanley Park is 1,000 acres of sheer beauty. It's covered in massive big fir trees, and is almost completely surrounded by ocean. There are formal gardens, an aquarium, totem poles and an abundance of furry wild critters. There is the Seawall, an 8.8 km (5.5 mi) walking/biking/jogging route around most of the park. A great place for families. There are beaches, and in the nice weather a plethora of local artists showing their talents. And space. No matter how busy Stanley Park seems to get in the summer, there is always a small glade or stand of trees to find yourself alone. It's even quieter in the winter, when I find it at its most splendid. You come to see Stanley Park once, you return time and time again to experience it. 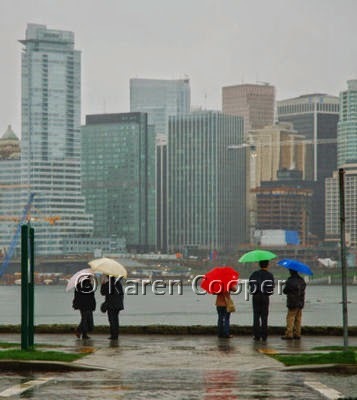 On December 16, 2006, Vancouver was struck by gale force winds, some reaching 119km/hr. That is nasty type winds that make you wonder if it really isn't the end of time. Stanley Park was devastated by the loss of thousands of her beautiful trees. She is now being restored, but of course will never be same. But maybe ... just maybe ... Mother Nature had a plan? Maybe what the future holds for this sacred place will be revealed in time. The miracle for me is .... so many people came together to work for the good of one thing. Put all the differences of colour and language and who drives what kind of car aside, and realized this is bigger than any of the petty stuff. This is life and life just is. Makes me smile at how smart Mother Nature really is. If we just look below the surface things in life. One of my favorite picures. The image of the gray, rainy day contrasted by the brightly colored umbrellas could not have been better had it been planned. Keep up the beautiful work, my friend.